I’ve recently started Hot Yoga, no this isn’t a new years resolution that will end in a week or two, but something I am loving to the max. It does however, deserve an entirely separate post, so hold tight and watch this space. One of the things I have noticed with this new regime of mine is that my eating has improved, i.e. I want to eat 3 meals a day. After yoga I am pretty ravenous and need something that will fill me up and quickly. Friday evening I wanted something tasty, but since I hadn’t been to the shops in a bit the options weren’t exactly endless. I got home and after a shower my tummy was grumbling. So I stuck on an episode of The Good Wife and headed to the kitchen. What I found were a few baby potatoes, a random selection of veg and a beef burger patti (I always have these in my fridge, either vegetarian, beef or ostrich – why because they are quick to make and easy when it’s just for 1). I stuck the oven on and chopped the potatoes into halves or quarters (size dependent), coated them with a drizzle of oil and popped them into the oven. I defrosted the patti and sat back for a while until the potatoes were starting to crisp up and turn golden. Oh boy I do love potatoes … I am not that girl who can say no to carbs! After about 20 minutes … when my tummy was really talking rather loudly I glanced at the potatoes and they were looking gooooood! Time to assemble the burger. What NO bun?! Well I didn’t have any bread and I’ve made burger stacks before which are pretty scrumptious so was confident this would be ok. I was not ready for the sheer epicness that was created! Yummy Delish DELUXE! What I found in the fridge was assembled as follows, while the patti was frying in a pan (and turned every minute … a trick I learnt from Heston). The bottom layer was slices of baby cabbage, topped with thin slivers of onion, a few slices of tomato and a good dollop of guacamole (thanks Woolies). On to that I gave myself a generous splash of Rik’s sister, Amy’s, homemade chilli sauce which is divine. While the burger was resting a little bit I topped it with some cheddar cheese and the residual heat helped it to start schmelting good and proper. Baby wedges were done and added to the plate along with my guilty indulgence – Spur pink sauce! Wowzer the combo wombo was out of this world. I don’t think it was because I was starving … I know this because I made a different version the next day for lunch (using a veggie patti). Yum Yum Yummy Delish! Happy days, I think this No Bun will become a firm favourite! Do you have a favourite NO bun version? 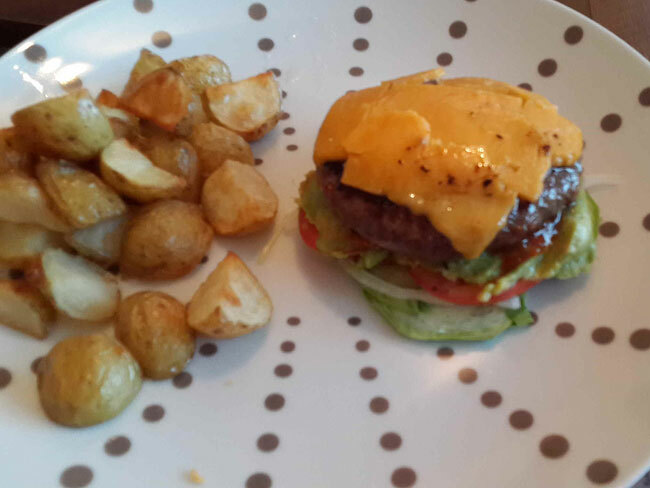 This entry was posted in Easy Supper, Eat and tagged burger, easy dinner, yummy delish.